On January 1st, 2016, China ended its One-Child Policy that has been enforced since 1979. Now the government encourages all married couples to have two children. There were several stages of Chinese reproductive policy after the People’s Republic of China was established in 1949. During the Great Leap Forward and the movement to form Rural People’s Communes, the Chinese government encouraged families to have as many children as they could. The state believed that more labor would create more wealth and improve the economy. They also honored mothers for giving birth to more than ten children at that time, generating a decade-long baby boom. Eventually, the Chinese government realized that if the population continued to increase rapidly, China eventually wouldn't be able to afford such a large population. 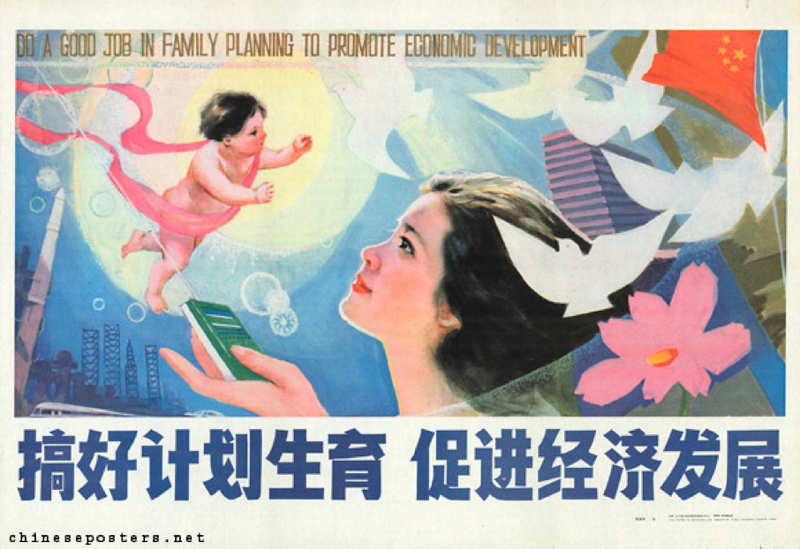 In 1979, the government, then led by President Deng Xiaoping, passed the “family planning policy.” The policy, applied throughout China province by province, contained a large portion of the one-child policy. Families that violated this policy could be punished with: various fines calculated based on family income, mandatory abortion, and/or the loss of a government job. The one-child policy had some exceptions, including for ethnic minorities. In addition, some farming families could have “one and a half children”, meaning that if the first born was a girl, the family would be allowed to have a second child. After the implementation of the one-child policy, based on the result of the Sixth National Population Census in 2010, the birth rate was 1.18, the lowest in the world. The only child generation in China faced many controversial arguments, and most of the problems created by the one-child policy have long-term influences on China’s social, economic, and individual development. Some considered them the “blessed generation.” Because they are the only child in their families, they received undivided attention and love from parents, grandparents, uncles and aunts. This generation also experienced the period of sustained economic growth in China. All of a sudden, they could watch color TVs, listen to music on MP3s, use smart phones, and play computer games— experiences that their parents’ generation could never imagine. The generation also has had an unprecedentedly high average education level: over 85% of children born in the 1990s have attended high school. They generally have an intimate relationship with their parents, which also causes parents to impose high expectations on their child, such as academic performance, jobs, and marriage. There are also a series of problems with individual and social development that only children have confronted. Some of them became spoiled: displaying characteristics such as selfishness, pessimism, and risk aversion. The most well-known case was the 13-year-old girl in Wuhan who threatened to kill herself because she didn't want her pregnant mother to give birth to her little brother. The one-child policy also led to severe gender imbalance and aging of the population in China. Some families that preferred boys to girls aborted the baby if they knew that it’s a girl. They would then try again for a boy. In 2012, there were about 40 million more men than women in China, including 18 million more boys than girls under 15 year old. The government estimates that by 2020, there will be about 30 million male adults unable to find a wife. As for the problem of an aging population, the burden is mainly on this only-child generation. In 2013, there were 194 million people over 60 in China, the largest senior population in the world. When their parents retire, the grown-up only children need to not only make a living for themselves and their own family, but also take care of their parents and even grandparents. The labor market will also face a lack of available workers. By implementing the inclusive second-child policy starting from January 2016, China expects to see a baby boom to ease problems such as the aging population and gender imbalance. However, the effect hasn’t been as obvious as expected. As the living standard and economic growth increased in China, more and more families want to have fewer children. The cost of raising a child is too expensive—housing, education, and even marriage. In 2013, when the government allowed couples for which one of the spouses was an only child to have a second child, only about 14 percent of eligible couples took advantage of the change. Now that the government is encouraging all families to have two children, it estimates that the change will allow an additional 15 million to 20 million couples to expand their families. Many people have been cheering for this policy. However, there are still many concerns from the parents. 44 year old mother Linda Zheng and her husband Markus Zhong from Ningbo, China decided not to have a second baby, even though they have always wanted a second child and their eighteen-year-old daughter has always wanted a sibling. “There is not difference than raising a second only child if we decide to give our daughter a sibling now, and it’s going to be even worse because we are not as energetic as we were when raising our daughter” said Linda, “our daughter is studying in the US and only comes home twice a year. There is no way that they are going to bond as close as siblings that grown up together.” Their older daughter would also face a burden, because when the parents retire, the older daughter would be responsible for her younger sibling’s expenses. “Our daughter is going to be a ‘younger mother’ for her little brother or sister before she creates her own life, and that would implement her from soaring. We don't want that for her, because it’s not fair.” said Markus. It will take at least twenty years to observe the actual effects of second-child policy in China, and it still hasn't been one year. We cannot yet conclude how much influence this policy will have on both the communal and individual level for the Chinese people, but it will give the next generation a less lonely childhood.